Situated on the corner of North State Parkway and West Goethe Street, this Beaux Arts building was once the luxury Ambassador Hotel. A building that has been granted landmark status, it's been renovated with a new façade and all new interior, making it one of the most visually stunning buildings in all of downtown Chicago. 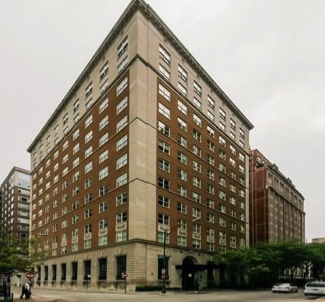 It is now known as The Ambassador Chicago, home to some of the most beautiful condominiums available in the area. As far as location goes, it doesn't get much better than the Ambassador, as you'll be just walking distance from some of the best dining and shopping in the entire Gold Coast and River North neighborhoods. For more information about The Ambassador condos for sale in Chicago, have a look at the active MLS listings below, or call Helaine Cohen today at (312) 953-0961! The Ambassador condos offer residents a number of upscale lifestyle amenities, which include 24-hour doorman service, a porter and receiving area, a state of the art fitness center, bicycle storage, an lavish owner's lounge with plenty of large-scale entertaining space, as well as a cover-able landscaped terrace garden and dog walk area, which come in especially handy during the cold season here in Chicago! The Ambassador Chicago contains 38 condos featuring thoughtful architectural details such as elegant crown molding, beautiful fireplaces and high-end finishes in kitchens and bathrooms.If you're looking for a great view of the downtown Chicago cityscape, most units inside The Ambassador offer just that. Come see The Ambassador condos in Chicago. We're confident you'll want to stay forever once you set foot in this beautiful building! Contact Helaine's team today to arrange a personal tour of The Ambassador condominiums.